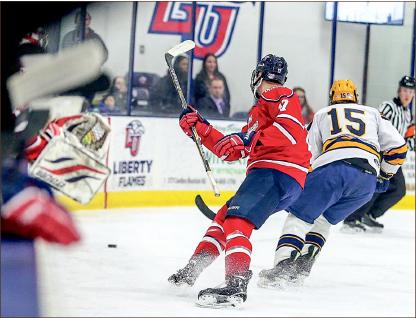 Liberty men’s Division I (DI) hockey team swept West Virginia University (WVU) off its feet in a two-game series on Valentine’s weekend. Unranked and already out of the playoff race, the Mountaineers played like a team with nothing to lose, forcing the 13th-ranked Flames to earn their 3-0 game one win. Physical play slowed the game from puck drop and made scoring hard to come by. It was senior forward Ryley Egan, assisted by sophomore forward Robert Ward, who first found the back of the net midway through the first period. “It’s something we really enjoy doing once a year, and I thought it was a great success again,” Handy said. Shortly into the second period, junior forward Bram Erickson put away one of his own, assisted by junior forward Danny Logan. The game stayed quiet until the middle of the third, when senior defenseman Cam Bakker combined with senior forward Lindsay LeBlanc and freshman forward Paul Lamoureux to score on the power play — a goal of special significance, given the Flames recent power play struggles. Bakker said the play that set up the scoring opportunity was one on which the unit had been working all season, giving it an air of relief. The highlight of the game, however, was yet to come. Just over a minute later, Liberty crashed the WVU net once again, sparking a brawl into which the increasingly frustrated Mountaineers goalie readily jumped. Flames goalie Matt Pinel, at the urging of his teammates, crossed the blue line himself and joined the fight. LeBlanc, Pinel and freshman defenseman Ben Hughes were each ejected and given a game disqualification for fighting, while Bakker was handed a 10-minute misconduct. Even in the absence of their penalized players, the Flames managed to turn up the heat for game two, putting away a 7-0 win that Handy called one of the team’s best showings of the season. The forward line combination of Ward, Egan and freshman forward Grant Garvin combined for a whopping 12 points (five goals, seven assists), driving the Flames offensive effort. Senior forward Christian Garland added a solo shorthanded goal in the second and Lamoureux, junior forward Kyle Miller and freshman forward Luke Simon combined for one midway through the third. 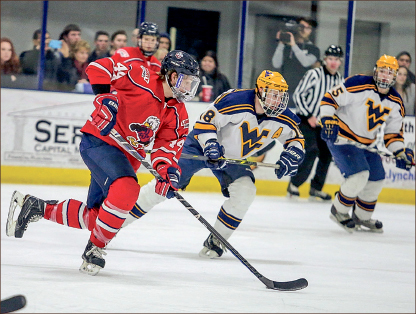 With third-ranked Minot State University coming to town this weekend, the Flames hope to keep the goals coming. The Flames will face the Beavers at 7 p.m. this Friday and Saturday, Feb. 20-21, in the last home series of the season.